The Chancellor’s comments came as cross-party negotiations to try to break the Brexit deadlock continued after the UK’s exit date from the EU was delayed until October 31. Mr Hammond told Bloomberg: “The Prime Minister has said that she will leave once she has done the deal and taken us out of the European Union. “But, as far as I know, she doesn’t have any intention of leaving until that deal is done. “So, she is a person with a strong sense of duty. The Chancellor said Labour was not clear on whether it wanted a new Brexit referendum. “Some people in Labour do, some people in Labour are very strongly opposed to it. “So, they have got to decide whether it’s an ask yet... in these discussions. “And then if they did, what that would mean would be some kind of process by which the House of Commons was invited to decide on this issue. “Now, some people in the Commons are very keen on a second referendum, but some are strongly against. Mr Hammond said fighting the European Parliament elections would feel like a “pointless exercise”. He said: “Clearly nobody wants to fight the European elections - it feels like a pointless exercise. The Prime Minister has made clear she intends to bring her Brexit deal back to the Commons for a fourth time after EU leaders agreed to extend the Article 50 withdrawal process to October 31. The UK is now formally on track to hold elections, having informed the European authorities ahead of Friday’s deadline that it would be taking part in the ballots occurring across the continent from May 23-26. 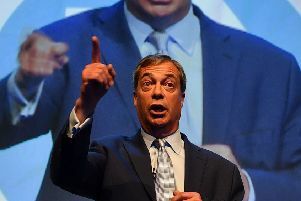 Preparations for the polls were stepping up a gear, as Nigel Farage launching his new Brexit Party in Coventry. 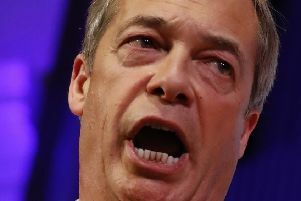 The former Ukip leader said the existing parties should “fear the electorate” who feel “betrayed” by the failure to deliver EU withdrawal almost three years after the 2016 referendum. Meanwhile, the Daily Telegraph reported that Home Secretary Sajid Javid “drew up a detailed technological plan to do away with the Irish backstop”, but it was stopped by the Treasury.